Laptop vendors are viewing a six-core Intel 8th Gen processor as a key selling point in 2018. The Core i7-8750H appears to have become the chip of choice among high-performance 15.6in machines, but while the CPU can hit speeds of up to 4.1GHz, a base frequency of 2.2GHz puts manufacturer integration into sharp focus; fail to provide adequate cooling and performance can easily be stifled. Our benchmarks on 8th Gen laptops have revealed that multi-threaded potential can vary by as much as 25 per cent, and for the enthusiasts out there, that's something to try and avoid. 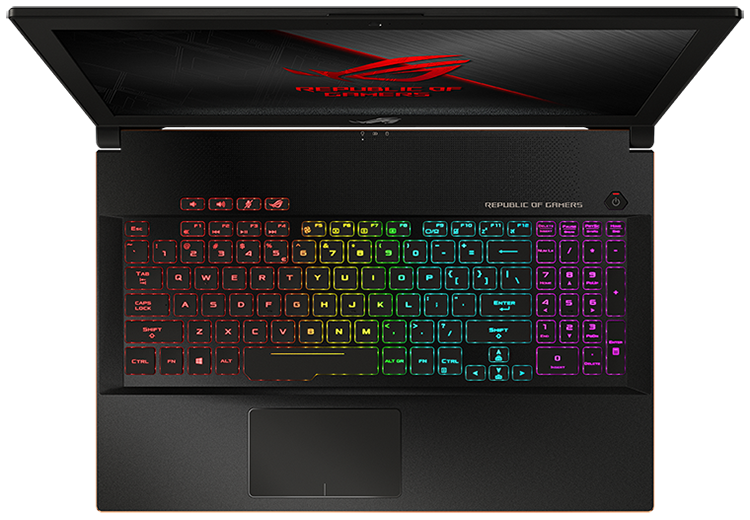 Asus reckons it has the answer in the form of the ROG Zephyrus M GM501, which claims to prevent "clock throttling that robs you of precious horsepower." Look and sound familiar? 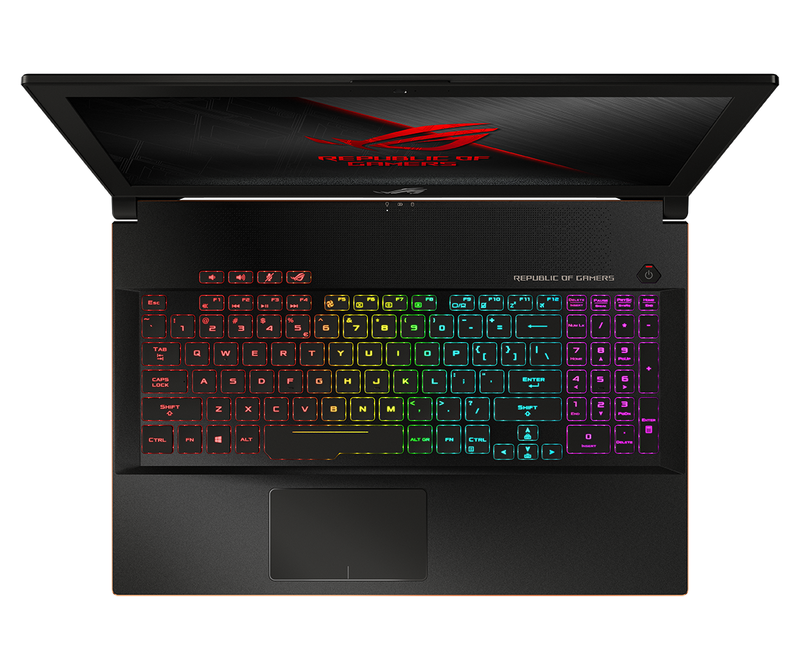 Zephyrus launched around this time last year as a showcase for Nvidia Max-Q GPUs, but the original model had its problems; battery life was dire; the keyboard position and right-sided trackpad were awkward; and at £2,750 it was pricey for a quad-core gaming laptop. Fortunately for fans of the original design, the 2018 refresh appears to solve some, if not all, of those issues. 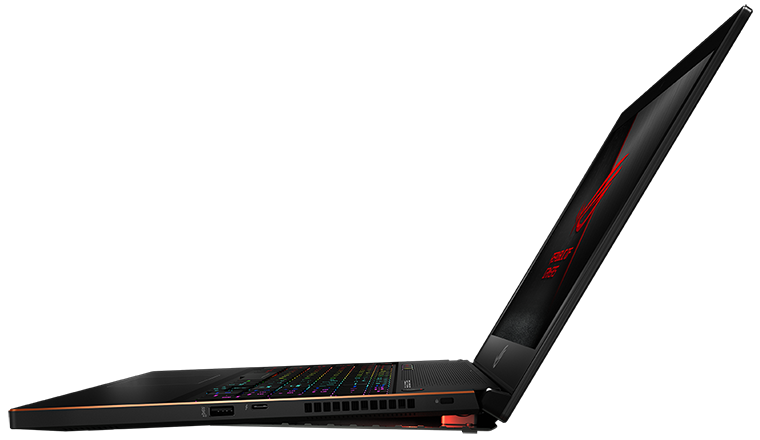 The keyboard and trackpad have adopted a more traditional layout, there's now a hexa-core Intel CPU at the helm, graphics take the form of a full-fat GeForce GTX 1070, and the price tag has dipped to a more palatable £2,200. Having enjoyed the eye-catching appearance of the original, we're pleased to see that Asus has retained the external look and feel. 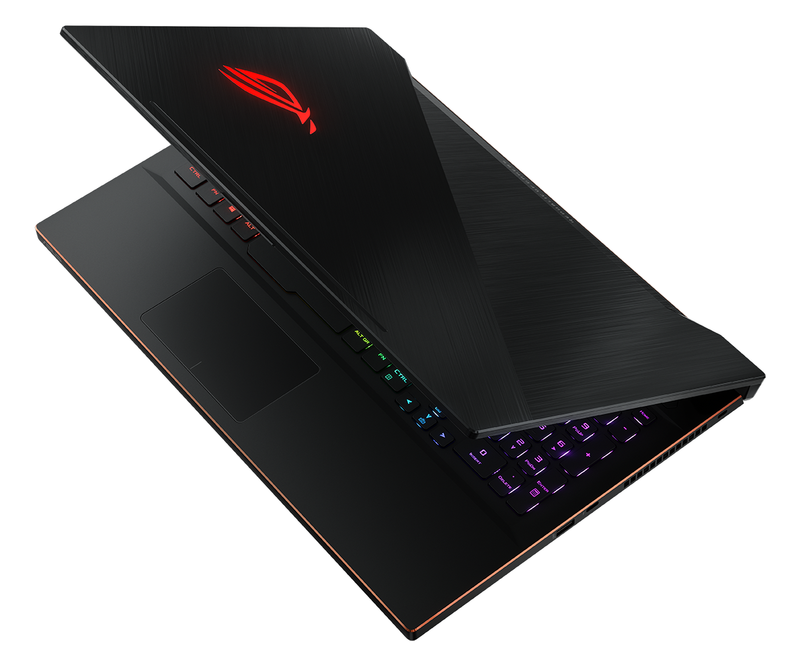 The split black lid is stylish with brushed metal marks running in two directions, the chrome trim surrounding the inner lip adds a little extra interest, and though the backlit ROG logo on top might be a bit much for some, we reckon Asus has done a reasonable job of delivering a gaming aesthetic that isn't OTT. Build quality is decent throughout - there's some flex in the display lid but the body itself is suitably rigid - however it's a shame Asus hasn't improved the look of the display. The 15.6in 144Hz G-Sync panel has merit, yet those bezels are comparatively huge by today's standards, and though a chunky border won't do any harm, it's a sure fire way of making a premium machine look dated from the off. 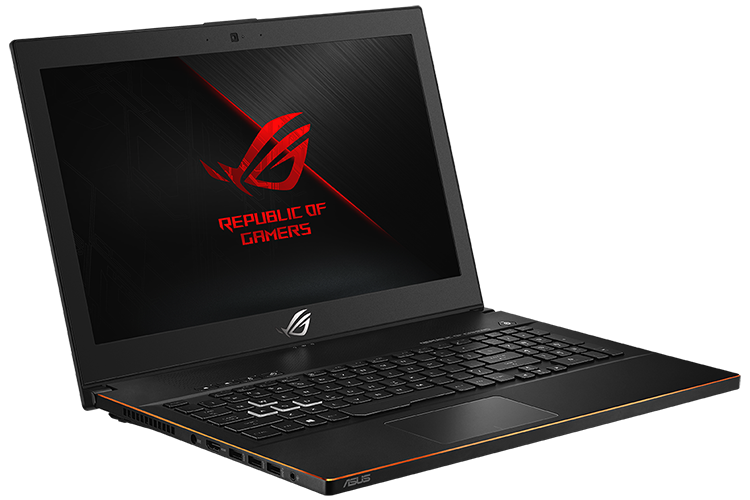 Given that Zephyrus v1 was proclaimed as the world's thinnest GTX 1080 laptop, it may surprise you to learn that the v2 revision is both larger and heavier, measuring 384mm x 262mm x 19.9mm and tipping the scales at 2.45kg. An extra 2mm of thickness and 0.25kg of additional weight is hardly detrimental to the overall experience, yet it's a sign that Asus is maintaining its focus on improving cooling performance first and foremost. 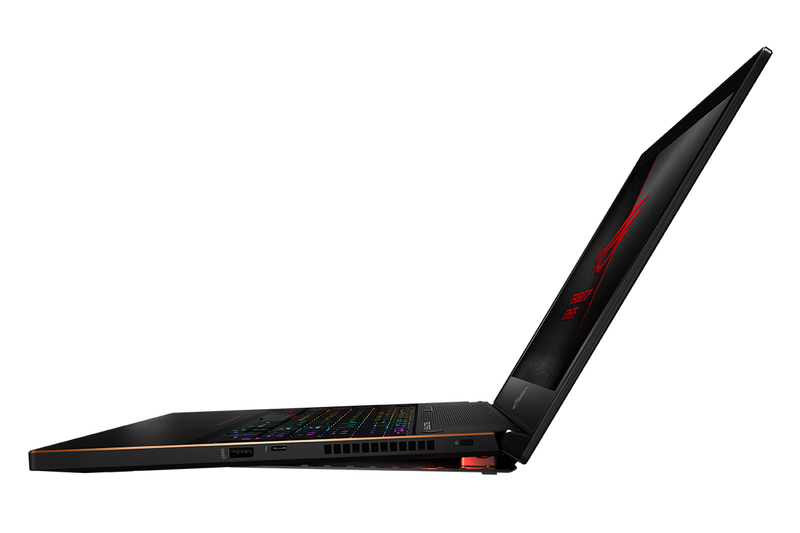 Key to the full-throttle mantra is an Active Aerodynamic System (AAS) that raises the rear of the laptop as the lid opens by flexing the bottom panel. It's a neat idea and Asus's implementation works well - the keyboard inclines to a comfortable level, with no unwanted movement, and the opening naturally aids airflow. According to Asus, the opening is "a couple millimetres wider than on the Zephyrus GX501," with dual 12V fans pulling air from below and above courtesy of perforated venting on the panel between keyboard and display. An "anti-dust design" is said to prevent dirt from entering the system - though the back panel can be removed for cleaning - and there's plenty to boast about when it comes to cooling performance. Compared to regular laptop designs, AAS touts 20 per cent more room for air circulation, a 32 per cent increase in airflow and a 20 per cent reduction in operating temperatures. All that cooling potential bodes well for the hardware within. Joining the six-core, 12-thread Core i7-8750H processor is 16GB of DDR4 memory, a 512GB Samsung SM961 M.2 SSD and GeForce GTX 1070 graphics. The Nvidia GPU is of the full-fat variety - there's no Max-Q suppression going on here - yet while Asus ticks the right boxes for CPU, GPU and storage, it misses a trick by providing memory in a single-channel 16GB configuration, as opposed to the preferred 2x8GB. What sort of display would be best suited to such components in a gaming laptop? That's up for debate, but Asus favours speed over resolution, settling on a 15.6in 1080p panel with a 144Hz refresh rate. There's no option for a touchscreen, and peak brightness leaves something to be desired, however viewing angles are good and we particularly like the fact that Asus offers both Optimus power-saving technology and G-Sync framerate smoothing. 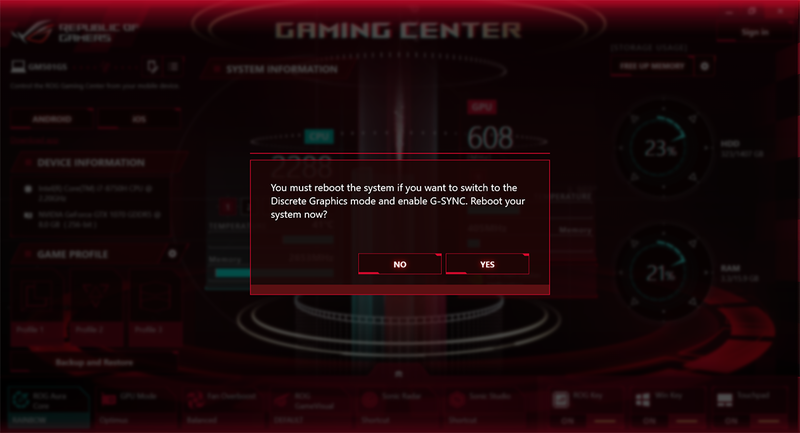 The two remain mutually exclusive, so can't be used simultaneously, but a toggle in the ROG Gaming Center app allows the user to switch between modes. Doing so isn't exactly seamless - you need to reboot for the change to take effect - but it is nice to at least have the option. Peripheral connectivity options are decent with the Zephyrus M GM501 offering two USB 3.1 Gen 2, two USB 3.1 Gen 1, Thunderbolt 3 Type-C, HDMI and a combination audio jack alongside the connector for the 230W external power supply. 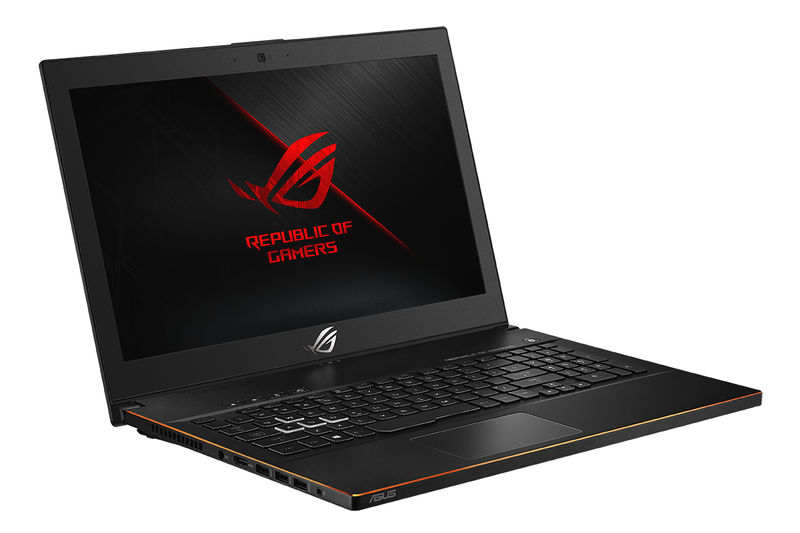 The one obvious niggle is the omission of Ethernet, and though Asus will point to the inclusion of a high-performance Intel Wireless-AC 9560 WiFi adapter, we're of the opinion a gaming laptop ought to have a wired connection as standard. After the unorthodox layout of last year's Zephyrus, the revised keyboard and trackpad are a welcome return to the norm. The keyboard is well-sized with an integrated numpad, Aura Sync illumination and highlighted WASD. It is a pleasant typing experience, with a quiet action and a travel distance of 1.4mm, though the use of a single-height Enter key on the UK layout may be off-putting to some. Joining the keyboard is a precision trackpad that responds well to Windows 10 gestures but feels just a tad loose under the finger, with a slight noise identifying the give each time you make contact. Elsewhere, the system's downward-firing speakers left us pleasantly surprised with crisp, loud sound that isn't entirely void of depth, and like many others in the industry, Asus is adopting a cleaner install of Windows 10. There are a few remaining offenders - McAfee Security and Asus Hello have a tendency to nag the user - plus if the annoying whooshing sound effect at boot is doing your nut in, it can be disabled using the "animation post logo audio" setting in BIOS. Enough of the pre-amble, let's get on to the benchmarks and see if AAS is all it is made out to be.